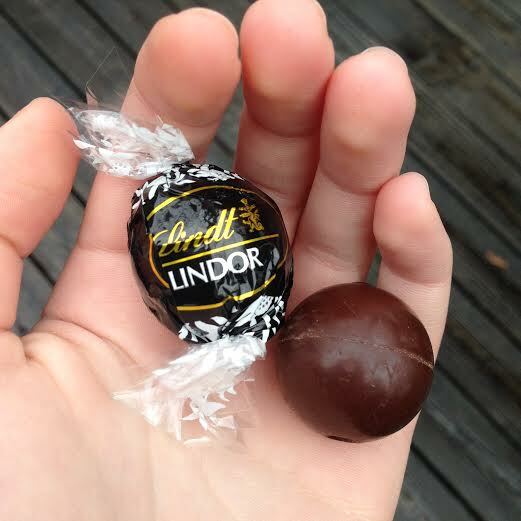 My mom bought a huge bag of assorted Lindor truffles. Some are filled with white chocolate, some contain a rich peanut butter mousse, and some (my personal favorite) are wrapped in shiny black foil, with an extra dark chocolate shell enrobing a smooth dark chocolate center. 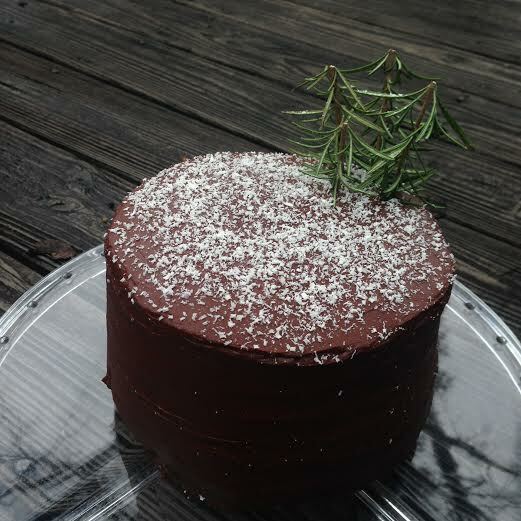 This cake encapsulates the truffle’s bittersweet richness, and is topped with a little lot of snowy rosemary evergreens. For the frosting, I took a one pound block of dark chocolate from Trader Joe’s (it was a gift), melted it down, and swirled in some sour cream. The idea came from Joy the Baker’s new cookbook Homemade Decadence! She is amazing! This cake works well as a dessert for a small holiday dinner party or family gathering. Eat thick slices of it on Christmas Eve, topped with a spoonful of hot fudge, a drizzle of salted caramel, or a scoop of melty vanilla ice cream. A shot of Bailey’s or Kahlua would be an extravagant accompaniment to this cake. Preheat the oven to 300º fahrenheit (300!!! Not 350!!) Grease two six-inch pans and line with parchment paper rounds. Grease the paper. Mix the chocolate with the hot coffee and set aside (don’t stir). Whisk together the sugar, flour, cocoa powder, baking soda and powder, and salt. In a stand mixer, beat eggs until thick and lemon colored. Add the oils, buttermilk, and vanilla. Stir the chocolate-coffee mixture and add it to the wet ingredients. Add the dry ingredients to the wet and beat for twenty seconds. Pour evenly into the pans, filling them a little more than 3/4 of the way (you might have a little batter leftover). Bake for about an hour – keep an eye out and check them with toothpicks until they come out clean with a few moist crumbs attached. Let cool for five minutes in the pans, then turn out onto racks and let cool for at least an hour. 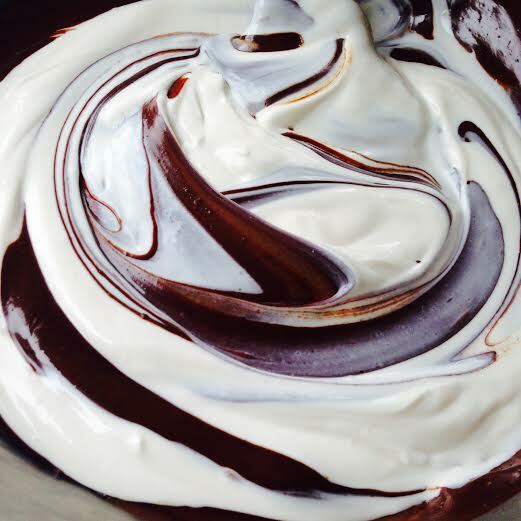 For the frosting, set the chocolate in a heatproof bowl above a pan of simmering water (or use a double boiler). Stir every now and then, until the chocolate is smooth and completely melted. Remove from the heat. While the chocolate cools, whisk together the sour cream, vanilla, salt, and corn syrup. Stir in the chocolate. Add the heavy cream one tablespoon at a time, until you reach your desired consistency – frosting will thicken as it cools. 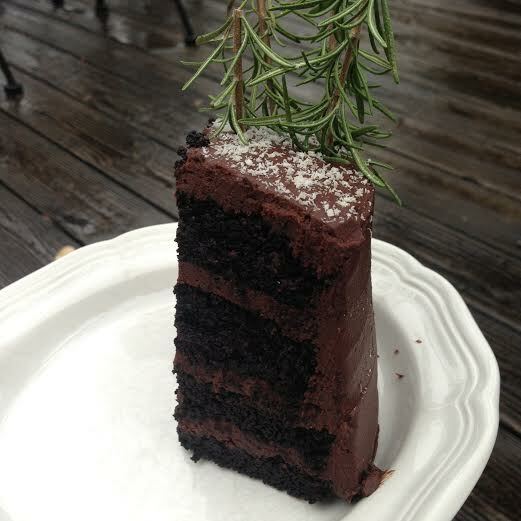 Slice each cake into two layers, fill, frost, dust with powdered sugar, and top with inverted sprigs of rosemary.